John Beresford lived in Dundee with his wife and family from 1858 through to 1865. He worked for HM Customs and was highly regarded and respected. His departure to Southampton prompted a farewell eulogy in the Dundee Courier. Trinity House - collector of Tay light dues 1858-1865 Royal National Lifeboat Institute local committee member 1861-1865.
no.56 Thomas Couper and no.238 Anthony Trail were all fellow local committee members of the Royal National Lifeboat Institute (Dundee Branch). Subscriber no7 Patrick Anderson was treasurer of the Dundee branch of the RNLI and subscriber no.137 James McEwen was secretary. John Beresford worked for HM Customs and lived in several places throughout the UK, including the Isle of Man, Dundee, Southampton and latterly, the Isle of Wight. Some of his children are listed in census documents as having been born in Ireland, suggesting that he may also have lived in Ireland from time to time. He was a customs officer in the Isle of Man before moving to Dundee in late 1857. He was promoted, on increased salary, to Southampton in 1865. John Beresford lived in several different places within the UK. There is conflicting information regarding the spelling of both his surname and his middle name and also the forename of his spouse from census and probate documentation. See notes below. John Beresford lived in a well-to-do street in Dundeewith two servants, and although no memberships are mentioned he was clearly a man with opinions. He put in a complaint to the Sanitary Committee about muddy pools at the bottom of his street, saying he would give up his house unless the nuisance was removed. He objected formally to a proposed drainage outlet into eastern side of the harbour. His wife and daughters attended balls at the Chamber of Commerce, the Whist Centenary Party and the Shakespeare Tricentenary. In September 1863 Mrs Beresford was given a ticket of admission for the platform to watch the grand procession marking the opening of Baxter Park. He made modest donations to the Soup kitchen and the Lancashire Relief Fund and the Indigent Gentlewomen Fund. In April 1861 his daughter Ellen Caroline died aged 18 . He retired from his position of customs collector in Southampton in 1873 and died six years later in the Isle of Wight . His widow Matilda died in Southsea in 1886. The family is listed in the 1851 census of the Isle of Man however the surname is spelt Berresford and his spouse is listed as Matilda Ann. The following are listed in the household: John G Berresford aged 45, born Ireland, HM Collector of Customs; Spouse, Matilda Ann, aged 43 born England; four daughters Maria aged 17, born England, Susan G aged 11 born Ireland, Ellen C aged 8 born Ireland, Henrietta L aged 5, born Ireland; and his son Hammilton aged 1 born Ireland. Also three servants Chastine Getson aged 57; Cath J Chestney aged 34 and Maria Colemand aged 30. All three are listed as being born in Ireland. There is no listing in the 1841 Isle of Man census. The family is listed in Dundee in the 1861 census of Scotland. (Note the change in both the family surname and the spouses forename.) The following are listed in the household: John G Beresford, aged 55, Collector HM Customs; wife Isabella Ann Beresford aged 53 b.England; Maria aged 27 b. England; Susan G, aged 21 b.England; Helen C. aged 18 b. Ireland; Isabella S? aged 15 b. Ireland; Hamilton D aged 11 b. Ireland. Also three servants Catherine Gebor (sp?) aged 68 b. Ireland; Elizabeth Care aged 35 b. England; Charlotte Care aged 26 b. England. The family is listed in the 1871 census of England in Southampton . (Note the spouse forename is now listed as Matild.) The following people are listed in the household: John G Beresford, aged 65, born Ireland, Collector of Customs; Spouse Matild, aged 65 born Bristol; Daughter Susan G aged 31, born Ireland; Henrietta aged 25 born Ireland; two servants Charlotte Carne aged 32 and Elizabeth Carne aged 45 both born Cornwall. 1861 Census Scotland. Liff and Benvie. 282/2 ED25 p.15. 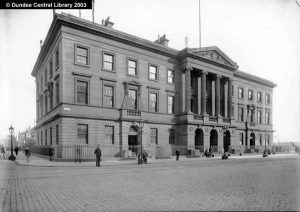 Accessed from microfilm Dundee Central Library. Statutory Register. Dundee. Death. 1861. 282/2475. Accessed through Scotlands People website. 1871 Census England. All Saints Parish, Southampton, District 34. Accessed through Ancestry.com. Church Record. Bristol, England, Select Church of England Parish Registers, 1720-1933. Accessed through Ancestry.com. Dundee Courier, 27 April 1861, p.3. Accessed through the British Newspaper Archive. 1851 Census Isle of Man. Conchan Parish, District 3a. Accessed through Ancestry.com. Dundee Advertiser, 21 February 1865, p.2. Accessed through the British Newspaper Archive. Testamentary Records. England & Wales, National Probate Calendar (Index of Wills and Administrations), 1858-1966, 1973-1995. Accessed through Ancestry.com. England and Wales Civil Registration Death Index, 4th quarter, vol 2b, p.369, 1879. Accessed through Ancestry.com. Hampshire Advertiser, 23 April 1873, p.2. Accessed through the British Newspaper Archive. Dundee Advertiser, 9 January 1863, p.4. Accessed through the British Newspaper Archive. Dundee Advertiser, 14 April 1864, p.4. Accessed through the British Newspaper Archive. Dundee Advertiser, 11 March 1863, p.2. Accessed through the British Newspaper Archive. Dundee Advertiser, 1 March 1862, p.2. Accessed through the British Newspaper Archive. Dundee Advertiser, 10 September 1863, p.3. Accessed through the British Newspaper Archive. Dundee Advertiser, 25 January 1862, p.2. Accessed through the British Newspaper Archive. Dundee Courier, 25 November 1862, p.2. Accessed through the British Newspaper Archive. Hampshire Chronicle, 27 February 1886, p.8. Accessed through the British Newspaper Archive. The information above about John George Beresford has been collated from a range of digital and hard copy sources. To the best of our knowledge it is correct but if you are relying on any information from our website for the purpose of your own research we would advise you to follow up the sources to your own satisfaction. If you are aware of an inaccuracy in our text please do not hesitate to notify us through our Contact page.